Do you still feed the birds during the hot summer months? I certainly do because I enjoy watching my backyard visitors all year long. Plus, there are some birds that I only see in the summer time and if I didn’t have my bird feeders stocked with good food, I would probably miss them. 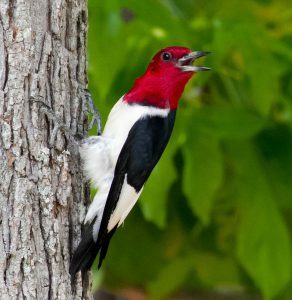 One specific bird that is always a treat is the Red-headed Woodpecker. He just started visiting my suet feeder packed with plenty of nuts about a week. The platform feeder also attracts this woodpecker (along with other woodpecker species and blue jays) because it too has plenty of peanuts for the taking. I just love seeing that beautiful bird in my garden! However, many people ask the question…..should you feed birds in summer? The answer is Yes! Birds still need to keep up with their energy levels even during the summer to stay healthy with enough weight and stored fat to be able to survive when the colder months arrive. This is especially true for the new batch of juveniles that are showing up. ADDED NOTE: Birds do not become dependent on the bird food that you put out for them. This food is just a small percentage of a bird’s overall food supply. Natural food that they can find on their own if available are worms, insects, seeds from grasses, and berries from trees and bushes. You really miss out on a lot of entertainment by not feeding the birds in summer. I can sit out on my deck in the morning drinking my coffee, and witness a mama Northern Cardinal teaching its young fledgling how to find food. That high pitched raspy sound that the baby makes along with its fluttering motion is so fun to observe too. I also get to see the young Red-bellied Woodpecker coming in now (all on its own) and feeding at the suet feeder. It already knows how to defend itself against the other bully birds that may come in. Then there is the annual summer visitors that come in too. 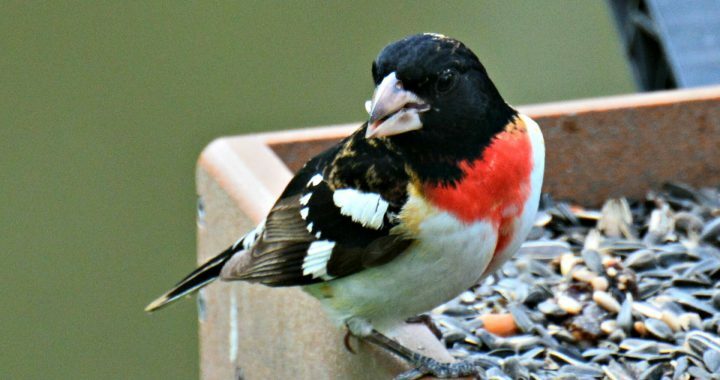 Grosbeaks, hummingbirds, and orioles are a few of the birds that come to mind. 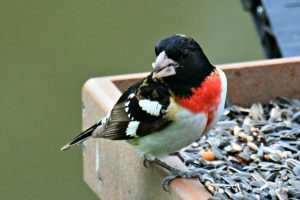 You may have other bird species coming in to your feeders depending on where you live. You can still feed suet to the birds in the summer that doesn’t melt like the winter suet would. This suet comes in different blends that may contain fruits, insects, meal worms, and peanut butter or nuts. Just check the label for “no melt”, or “no mess” or “summer” to make sure. The birds love it and you will love watching them come in to feed on it and no it does not melt. If you have orioles in your yard you can put out oranges that are cut in half and placed on an oriole feeder or stuck in a limb as we have done. 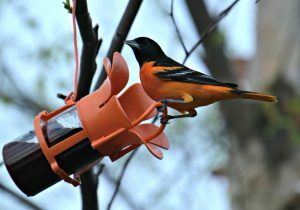 Orioles also love grape jelly too. Other birds that will feed on the oranges are grosbeaks, mockingbirds, robins, bluebirds, catbirds, tanagers, waxwings and towhees. Other fruit that you can feed the birds are grapes, raisins, blueberries, strawberries, cherries, currants, sliced apples, and the like. Robins, mockingbirds, waxwings, grosbeaks, bluebirds, tanagers, and towhees will be attracted to these. 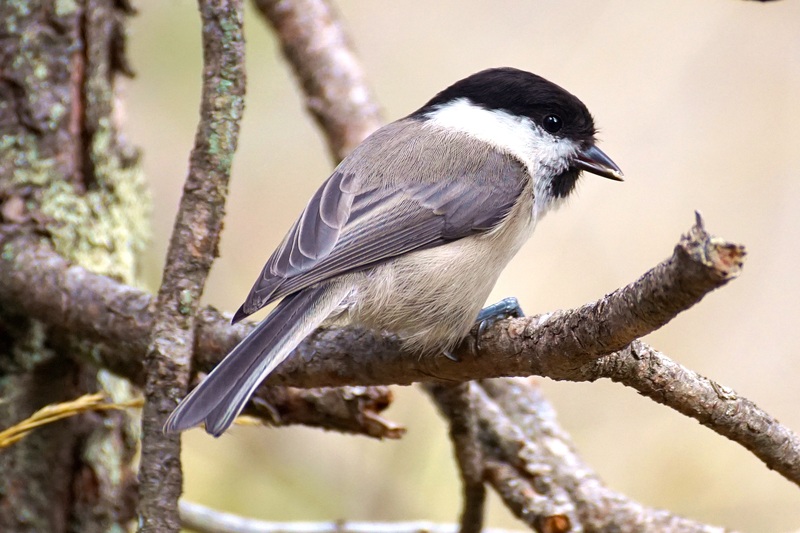 You can also purchase dried meal worms that you can place in your feeders which will attract bluebirds, chickadees, wrens, towhees, woodpeckers, robins, catbirds, nuthatches, and thrashers. Some people actually raise their own meal worms if you are in to that. I put out a supreme fruit and nut mix all year long that keeps the birds coming in regularly. Sunflower oilers alone are also good as well as nyger/thistle seed for the goldfinches and house finches. Mourning Doves may also feed on the nyger seed. Mix 1 part sugar with 4 parts water and bring to a boil. Extra sugar water (nectar) may be stored in a refrigerator for up to two weeks. No need to add red dye. Added Note: Keep an eye on your seed feeders and your hummingbird feeders to make sure mold is not growing in them. This can happen when seed or nectar sits too long. I do not have this problem with the seed because it vanishes as soon as I put it out. However, my hummingbird feeder is another story. I only get about four hummers until around late July. So I have to keep an eye on all of my hummingbird feeders to make sure there is no mold growing. Don’t forget to clean your seed feeder out ever few weeks. You should clean your hummingbird feeder every time you replenish it. Many people ask if they should continue to feed birds during the summer months. Birds can survive without the wild bird food that you provide as this makes up just a small percentage of their overall diet. However, it is a great supplement to help the birds maintain good body weight plus provides them the energy that they are going to need when the colder months start to settle in. If you enjoy the birds as much as I do you will also want to think about what you will miss if you don’t feed them. One example would be the parents of new fledglings bringing them in to your feeder and teaching them how to eat. Watching those baby birds flutter and call out is just too cute too. Another example is the summer visitors. I don’t know about you but I look forward to the arrival of the Red-headed Woodpecker, the Rose-breasted Grosbeak, the Cedar Waxwings, Baltimore Orioles, and definitely the Ruby-throated Hummingbirds. You may have different species visiting where you live but you get the picture. You may not get to see these beautiful birds if you don’t feed them. Yes, if you have the right habitat for them they will come probably come in anyway. However, if you are like me there is only so much that you can do with your garden and by supplementing it with bird feeders and water sources the visitors that you will get are countless. Posted in Backyard Birds, Songbirds, Wild Bird Food, Woodpeckers and tagged summer bird feeding, wild bird seed.